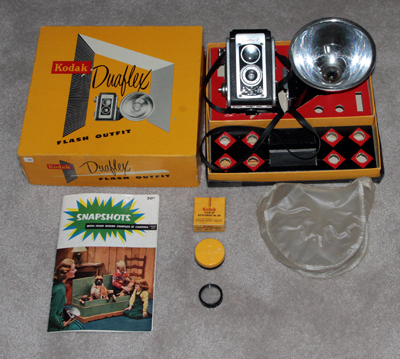 KODAK BROWNIE HAWKEYE CAMERA FLASH MODEL - 1950-61. Donated by Susie and Kevin Casanova. 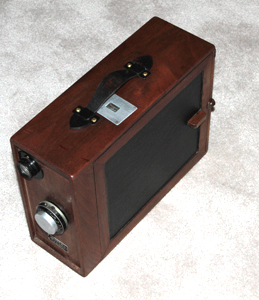 The Brownie Hawkeye models used 620 film which is now hard to find. In order to operate such cameras some users place 120 film onto 620 spools. MSRP $5.50. KODAK DUAFLEX II - 1950-54. Camera on left donated by Susie and Kevin Casanova. Inexpensive vesion of twin lens-reflex cameras. 620 film. MSRP $20 (about $188 in 2011 dollars). VIDEO TAPE RECORDER - 1951. 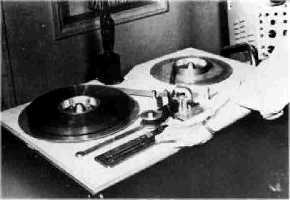 Bing Crosby Laboratories introduced the video tape recorder which recorded electrical impulses on magnetic tape. 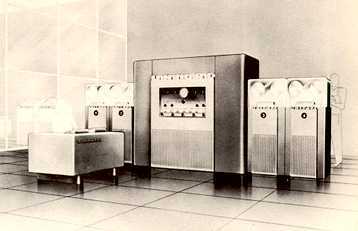 UNIVAC - 1951. The world's first commercial computer began use on June 14, 1951. UNIVAC weighed eight tons but has since been surpassed by today's laptop computers. ARGUS C4 - 1951-1958. What can you get for $10 these days? 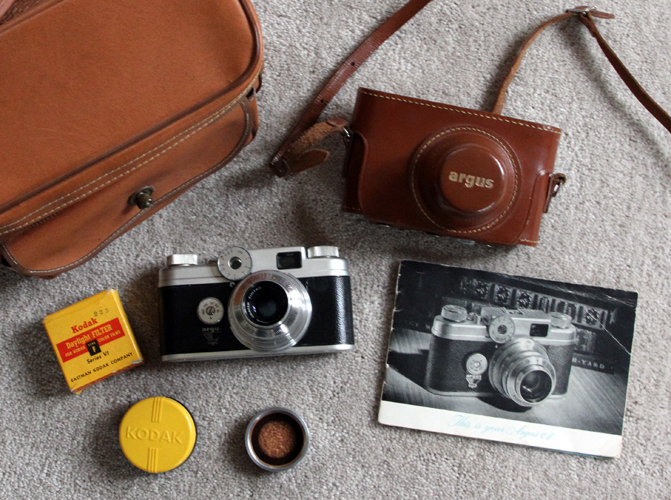 How about an Argus C4 in excellent working condition and physical appearance, a camera case also in excellent condition, an original manual, a daylight filter, and an inexpensive camera bag to carry it all! Argus has sold many hundreds of thousands of cameras over the years thus it is not uncommon to find any one of their various models in usable and collectible condition. If you have a young person in the family you wish to introduce to the hobby of photography, but without making a large investment, this is the way to go. Lens f/2.8 50mm. Shutter 1/10 to 1/300 sec. 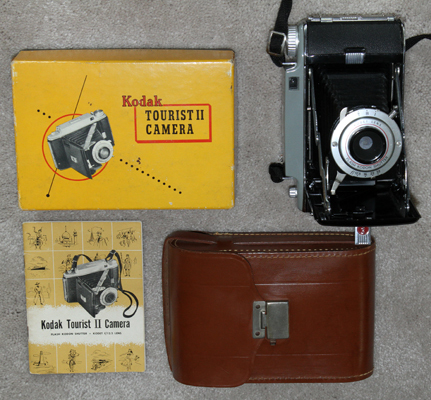 KODAK TOURIST II - 1951-1958. Update of the Kodak Tourist of 1948 and the last of the American made folding roll film cameras. Unusual back allows opening on the left, right, or removing the back completely. MSRP pf $95 (about $796 in 2010 dollars). One Tourist II with leather case was purchased on eBay in excellent condition for $10. When searching for an original manual to go with the camera, and with some individuals asking $15-$20 for the manual alone, I found a second Toursit II, also in excellent condition, with original manual and box for $11. COLOR TELEVISION - 1951. First U.S. color telecast. 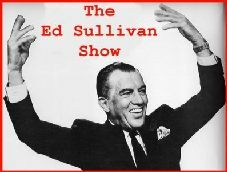 On June 25, 1951, with 12 million TV sets in existence, of which only two dozen could receive CBS color, CBS made history by presenting an hour long color TV program hosted by Ed Sullivan and Arthur Godfrey with 16 stars that performed song, dance and comedy routines. Click on left photo of Godfrey to see larger photos of Art and Ed. 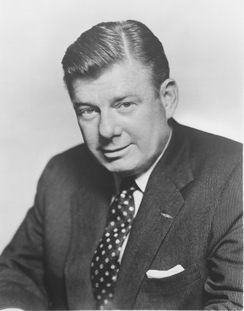 Image on the far right is an Arthur Godfrey original 7 x 9 inch Candid Camera TV program promotional photo. Godfrey was the host of Candid Camera for a period of time. 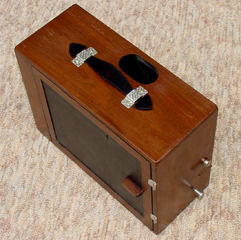 ILOCA STEREO II - 1953. One of various 3D cameras that have been popular over the years. There are hobby groups specifically dedicated to 3D cameras (Sydney Stereo Camera Club Inc., etc.). This particular model was also sold by Sears and Montgomery Ward. NTSC - 1953. In 1953, the FCC dropped the CBS color broadcast standard in favor of a system developed by the Radio Corporation of America (RCA). Named after the National Television System Committee, an FCC body that proposed the standard, NTSC is still used in North America and Japan. Later in the year, NBC -- at that time an RCA subsidiary -- aired its first color broadcast, a program starring Kukla, Fran, and Ollie and the Boston Pops. In 1954, CBS and NBC began regular color broadcasts even though only one percent of U.S. households owned a color television. 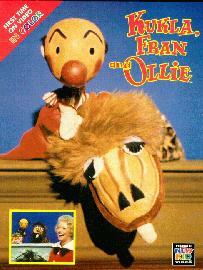 Click on the image to see large view of Fran and the puppets. 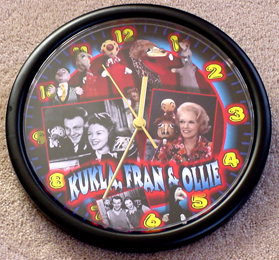 The clock on the right commemorates the Kukla, Fran and Ollie program and can be purchased online. ZEISS IKON CONTAFLEX I - 1953. The Contaflex I was equipped with a fixed Zeiss Tessar 45mm f:2.8 lens with front-cell focusing. The very first Contaflex I had a Synchro-Compur shutter with the old scale of shutter speeds (1-2-5-10-20-50-100-250-500), but very soon it adopted the new scale 1-2-4-8-15-30-60-125-250-500. The Contax I was Zeiss' answer to Leica's offerings in the 35mm market, one Leica effectively controlled since it helped create it in 1925. It had a large number of technology advantages as compared to the Leica. It had a longer effective rangefinder triangulation base for better focusing. It had a bayonet lens mount instead of Leica's screw mount. 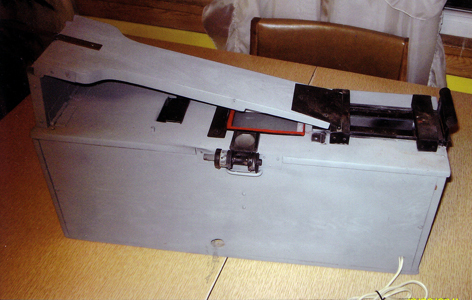 It also had a removable back for loading film instead of Leica's blind hole film loading system. To go up against Leica's horizontal travel fabric shutter (max. speed 1/500th), the Contax had a vertical travel articulated metal shutter (max. speed 1/1000th). It was less vulnerable to sun burn as well. It was the first 35mm SLR camera equipped with a between-the-lens leaf shutter. The above camera in excellent appearance and working condition was donated by our very dear friends, Jennifer and David Buckwalter. 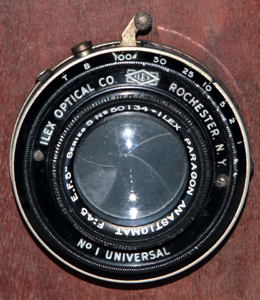 It is notable for two reasons: 1) Very few Contaflex owners purchased additional lenses for their camera, but this sample has a wide angle lens, a telephoto lens, and four close-up lenses; 2) The original owner of this camera was the nationally-known Dr. Douglas F. Parry of Texas A&M and Drake Universities. Dr. Parry was an expert in diagnostic and remedial education for exceptional children and lectured on that topic in many places across the nation. MSRP $169 (about $1,500 in 2015 dollars). ANSCO MEMAR PRONTO - 1953-60. Same as the Agfa Silette. Shutter 1/25 - 1/200 sec. Lens 3.5 45 mm Agfa Apotar. This camera had been purchased and then kept in a drawer and shows no signs of use. The case is in mint condition as is the manual except for slight age discoloration. The camera could also be called mint except for very slight age corrosion on the bottom edge. However, it did not appear this good when recieved. What seemed to be paint corrosion on many parts of the surface was easily cleaned off revealing a wonderfully pristine camera of satin chrome finish. This is actually the second of the Silette/Memar line and is an upgrade over the first Silette/Memar that had a paint finish. The apparent corrosion was probably what caused this gem to be sold for $15, less than many sellers often ask for a mint manual by itself. When buying or selling a camera be sure and determine what is corrosion and what is merely surface material that can be removed. Also, do a Google search to find out as much as you can about a potential purchase. Although McKeown's is a wonderfu source for information and pricing, it is often not complete, especially as regards slight variations from model to model. This camera is a good example. McKeown's makes no mention of the fact that there was a painted model and a satin chrome model and they show only one price range of $15-30. Obviously, the satin chrome model is more desirable because of the much greater durability of the surface finish. YASHICAFLEX A II - 1954. 6 x 6 cm TLR. Semi-automatic winding. Yashimar f3.5/80mm lens. Copal shutter, B, 1/10 to 1/200 second. MSRP $29.95 (about $264 in 2015 dollars). The above camera in excellent physical and mechanical condition was donated by our dear friends Jennifer and David Buckwalter. BRAUN GLORIETTE - 1954. The Braun Gloriette is typical of well-crafted German 35mm cameras that can be purchased in excellent physical and working condition for as little as $20. However, be aware that some sellers of old cameras try to take advantage of buyers who may not have done their homework. At the same time the above camera was purchased for less than $20, another seller was asking 129 Euros! FiRST ALL-COLOR TELEVISION SERIES - 1955. 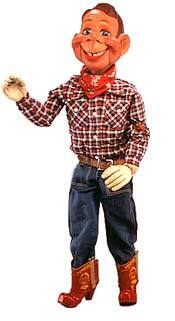 Howdy Doody TV program begins. 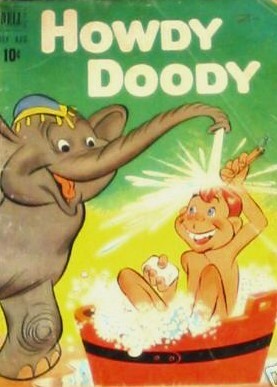 1951 Howdy Doody comic book shown on right. MINOLTA A - 1955. The Minolta A was launched by Chiyoda Kogaku Seiko in April 1955 as the first of their new series of rangefinder cameras. It featured an optical viewfinder with superimposed coupled rangefinder, a shutter speed thumb wheel on top of the camera and a rapid wind advance lever. Earliest version had two-blade Konan Flicker shutters with speeds B, 1/2sec to 1/200sec. The second version had Optiper -MX shutters with B, 1-1/300s (shown above). Non-interchangable Chiyoko Rokkor f3.5 / 45mm lens. MSRP about $50 ($440 in 2015 dollars). This Minolta A in near perfect physical appearance was donated by our dear friends Jennifer and David Buckwalter. 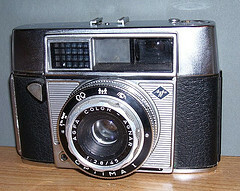 AGFA SOLINETTE II - 1955. The Solinette is an example of the limitless number of film cameras now available to the prospective collector at very reasonable prices. The Solinette II was of high quality construction, but somewhat unusual in that most 35mm cameras of the time were solid body rather than folding. Lens: 50mm, f3.5-22. Shutter: B plus eight speeds. The above camera in like-new condition with leather case was purchased on eBay for less than $40. 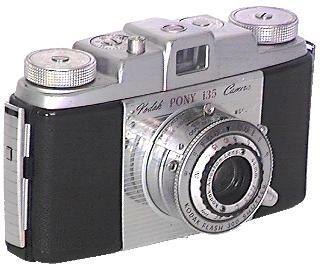 KODAK PONY 135 MODEL C - 1955. This camera sold in 1955 for $33.75 and can now be purchased in very good to excellent conditon for $10-20. An inexpensive camera then and now you might say. Guess again. $33.75 in 1955 would be equal to $267.39 in 2009! Lens: 44mm f3.5-f22. Shutter: 1/25-1/300 sec. 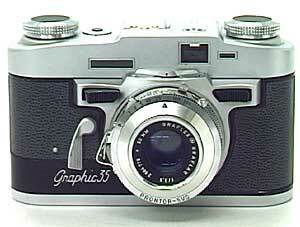 GRAFLEX GRAPHIC 35 RF - 1955. 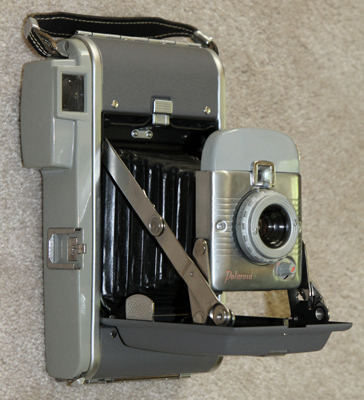 The Graflex Graphic was manufactured by the same company which produced the Speed Graphic cameras. It has a unique focusing mechanism consisting of two buttons, one on each side of the lens. Lens either f/3.5 or f/2.8. 50mm. Shutter 1 to 1/300 sec. KODAK CINE MEDALLION 8 - 1955. This is an example of why collectors become hooked on collecting. The Medallion 8 was advertised in the 28 November 1955 issue of Life magazine for $144.50. That would be about $1145 in 2009 dollars. The camera above is in virtually mint condition with no evidence to show that it was ever used. The case is also like new except for some brittleness due to age. Even the film cartridge appears as if had been placed there yesterday. It was purchased on eBay for the grand sum of $5. B&H TDC HEADLINER 300 - 1955. One of a great many slide projectors that can be purchased in excellent condition for relatively little cost. The above projector in almost new condition cosmetically, and still working, was sold on eBay for $20. The original MSRP with case was $60 in 1955, which would be about $500 in 2010 dollars. Because not too many people collect slide projectors, this is a good area for those who would like to collect a wide variety of models for display, but without spending a large sum. WESTON MASTER III 737 - 1955. 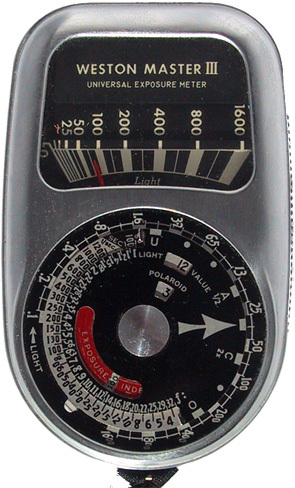 The Master III was the first Weston light meter with ASA film speeds. BELL & HOWELL 220 8mm SUN DIAL MOVIE CAMERA - 1952-58? Camera in like-new condition with case and original manual donated by our good friend Joan Klonowski of New Mexico. 10mm f2.5 Comat lens. F2.5-16. 8mm color or black & while film. List $39.95. BELL & HOWELL 323 8mm SUN DIAL MOVIE CAMERA - 1956. Another one of many B & H movie cameras that can be found in near mint condition. 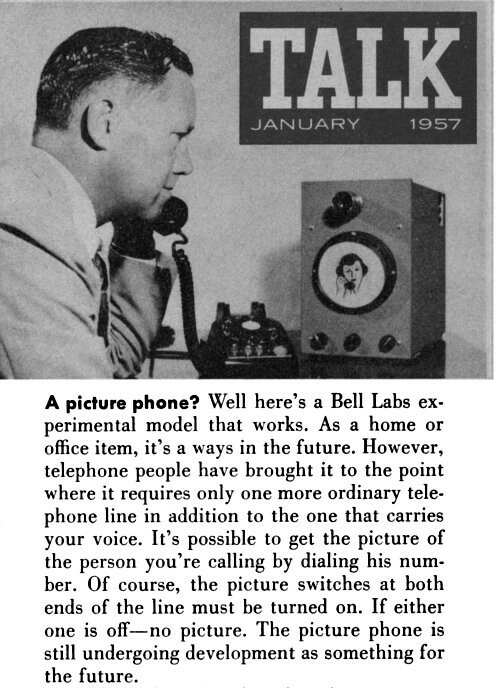 BELL LABS PICTURE PHONE - 1956. On August 23, 1956, Bell Labs announced their experiment with "picture phone" transmission that sends pictures along with sound over regular telephone line. FIRST COLOR SEPARATION SCANNING - 1955. 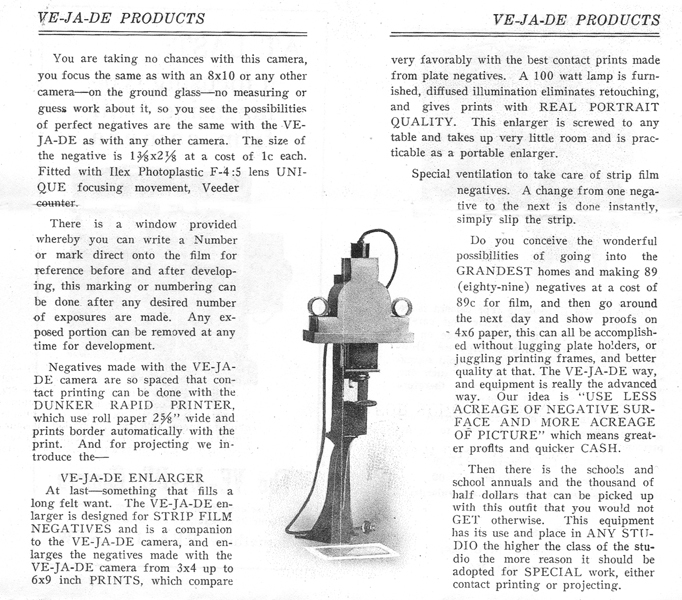 Printing Development, Inc.
FIRST VTR SALES - 1956. 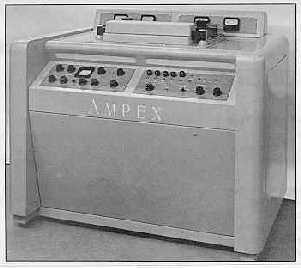 Ampex prototype and the Ampex VRX-1000, the first VTR ever sold. Ampex has a restored, operational machine in their museum in Redwood City, California. 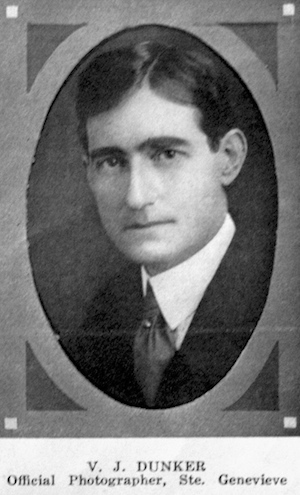 VINCENT JOSEPH DUNKER - AMERICAN PHOTOGRAPHER, INVENTOR, CAMERA MANUFACTURER - 1878-1974. 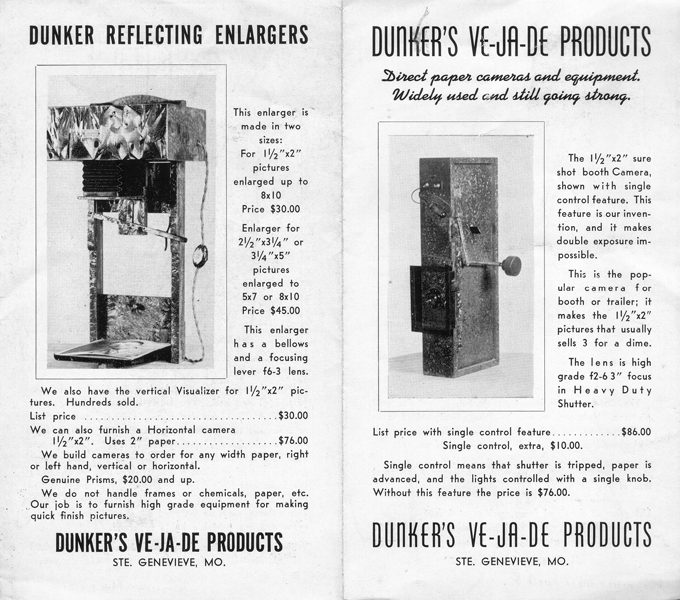 Vincent J. Dunker was a photographer, inventor and camera manufacturer who began his career in Ste. Genevieve, Missouri in the late 1890s. 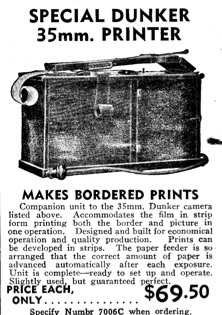 Dunker built a wide variety of cameras, contact printers and photo enlargers over a period of thirty-seven years. Annual production varied from about 100 units to more than 300 units. Many of his cameras were specifically designed for making high school photos for yearbooks and individual purchase by students. He is the first mass-builder of such cameras that we know of. As such, he can be considered the father of what is now a nation-wide industry. His cameras are frequenlty available on eBay, and due to their excellent construction, can often be found in near new condition. 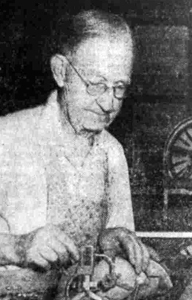 The photo on the right was taken in 1918 at age 40 and published in a magazine of the Southeast Missouri Drummers Association. It was recently discovered and submitted by Robert Mueller of Ste. Genevieve. The photo on the left is of Dunker in his workshop and is the only one known of him while actually producing camera parts. A short biography of Vincent Dunker can be seen by clicking here. The above photo of a Missouri pharmaceutical meeting is credited to Vincent Dunker, June 13-16, 1911. 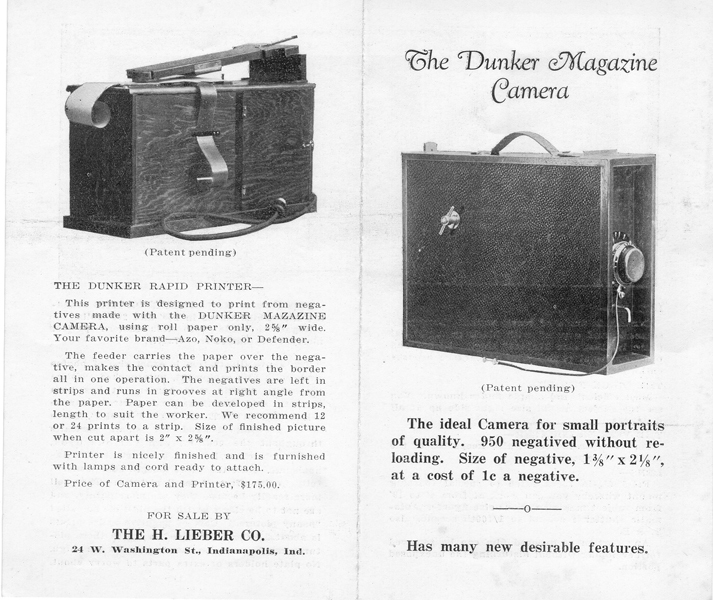 In 1924, Dunker built his first 35 mm long-roll camera which he intended to use for taking school pictures, but another photographer bought the camera from him for $100 (about $1,300 in 2011 dollars). He made a second camera, but quickly sold it also. 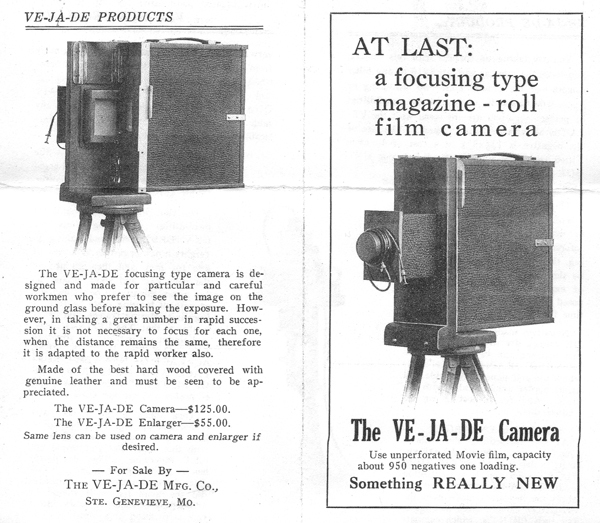 As a result, he dropped the idea of becoming a school photographer and instead began building cameras for sale under the name Ve-Ja-De Products (from V. J. Dunker) while also operating a photography studio. Dunker handbuilt all his cameras from walnut that he selected himself. Many of the parts such as the rollers and various aluminum pieces were also handmade. 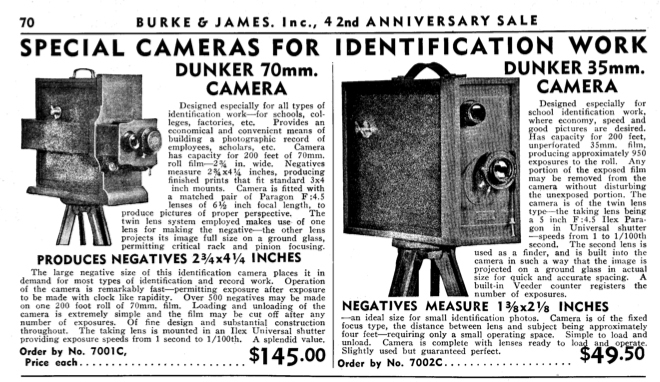 During World War II Dunker sold many hundreds, possibly thousands of his cameras to the U.S. Army for use in making IDs, photos of recruits, war prisoners, etc. He also designed and sold a photo both of the type whereby direct prints could be made for customers in a few minutes (1930s-40s). Dunker priced his school cameras at $98. "NEW Idea, Booth cameras, for making four for a dime photos, Reflecting enlargers.Visualizers. Ve-Ja-De-Products, Ste Gene-vieve, Mo." Popular Mechanics, March 1936, Advertising Section page 43A. 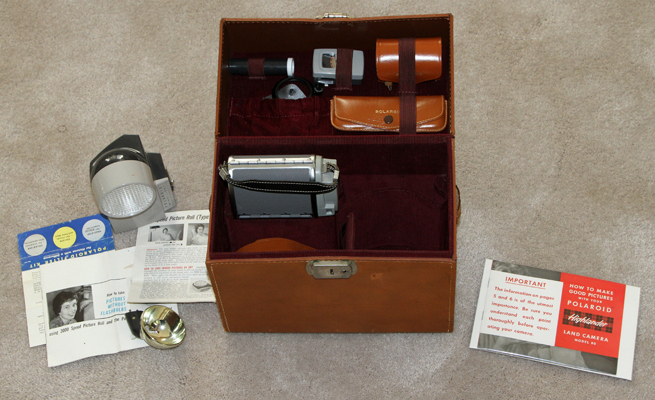 Left - The Dunker school camera showing the film counter (top), viewfinder lens (upper left front), and portrait lens with cap. Center - The brass knob on the left was used for advancing the film. 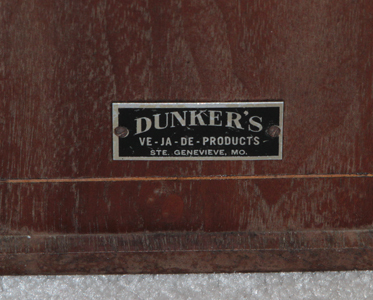 Right - The nameplate shows the company brand derived from Vincent J. Dunker's initials, VE-JA-DE. The above photo shows the left inside of the camera with a long roll of 35 mm film. When the film is advanced the t-shaped brass piece on the upper left turns and strikes a rod extending downward from the photo counter on top of the camera. Each time it strikes the counter the number is advanced by one. The counter on this camera read 8760. 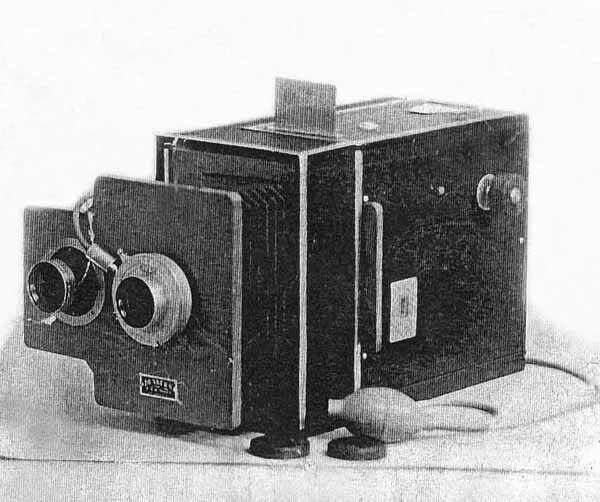 The string attached to the back of the camera was used to place the camera the proper distance from the subject to ensure a correctly focused image as the camera had no focusing mechanism. 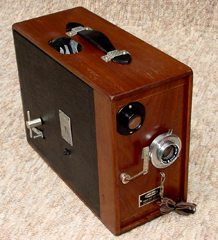 A unique feature of Dunker cameras was the use of unperforated 35 mm film. With very few exceptions, all 35 mm cameras made since the advent of 35 mm film were designed to use perforated film, often called cine film because of its use in the movie industry. The few exceptions to this rule used paper-backed unperforated film. 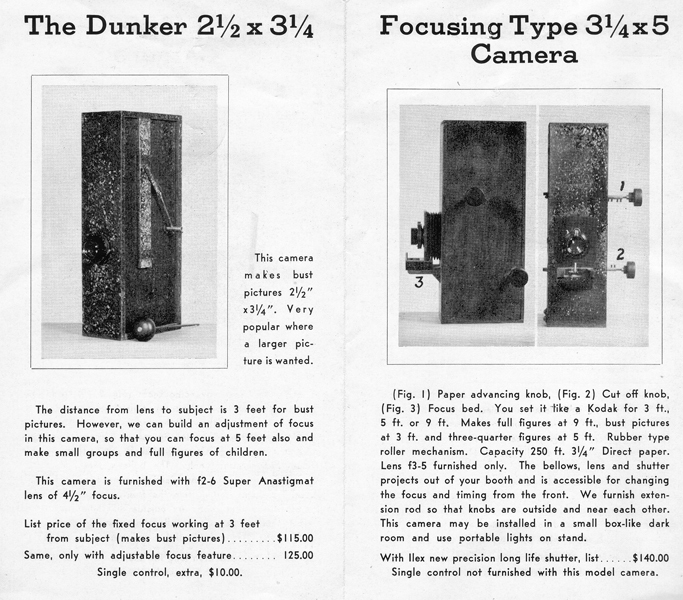 As can be seen in these photos, the Dunker cameras used long rolls of 35 mm film that were neither perforated nor paper-backed. On the upper left is the viewfinder hole for aiming the camera and checking focus. In the upper center is a frosted glass screen for viewing the subject. On the upper right front is the viewing glass focusing lens. The lens is marked ILEX PARAGON ANASTIGMAT F:4.5E.F.5" Series S No. 50134. ILEX OPTICAL CO.ROCHESTER, N.Y. No. 1 UNIVERSAL. The aperture adjustment (10:00 O'clock position) works smoothly, f/4.5 - f/32. Marked lens speed varies from 1 to 1/100 second, time and bulb, but seems to operate at the same speed regardless of speed setting. Bulb works OK, but not time. Note the Oct 1948 date on the lower battery. 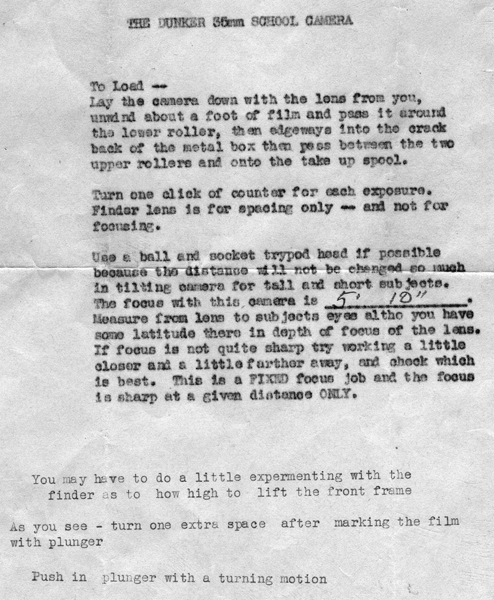 The date 11/12/48 was also written inside the camera in pencil, apparently indicating the last time the camera was serviced or loaded with film (and no, the batteries don't have any juice left!). 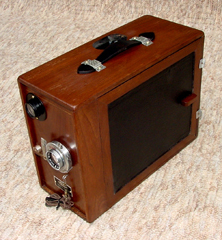 According to Dunker's grandson, Leo Pruneau Jr., the light and batteries are not part of the camera as originally made by Dunker, but are modifications put in place by one of its owners. The purpose of the light is unknown at this time as the wires have been cut on the other side of the camera. 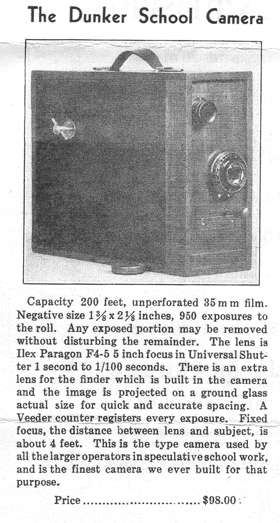 There may have been a device to cause the light to blink when the film was advanced the proper distance between photos. Unless we are contacted by the person who modified the camera, it is unlikely that we will ever know the purpose of the modification, or if it worked. The photo on the right is of instructions for a Dunker school camera, but perhaps not the camera shown above. The original instructions are in the Piqua, Ohio, city library and may be the only copy still in existance. The above camera appears to be a slighter later model. The string attachment has been moved to the front and a round viewfinder peephole ha been placed at the top rear of the camera. 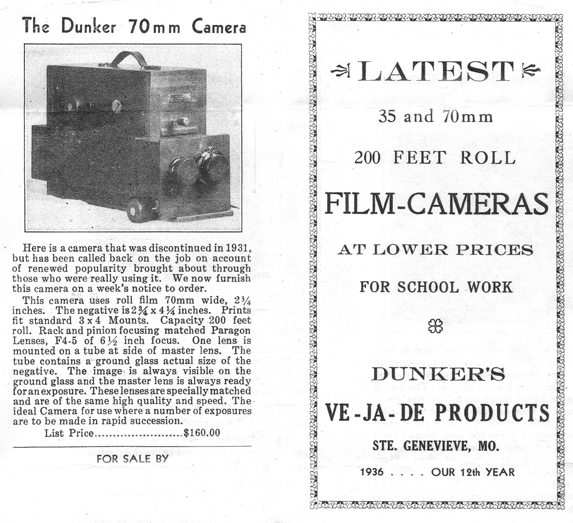 A 1939 ad for a new Dunker 70 mm camera and a used 35 mm camera. Note that the 70 mm camera has adjustable focusing. Photo on the far right is of a different version of his 70 mm cameras. 1936 flyer for Dunker 70 mm camera with rack and pinion focusing. 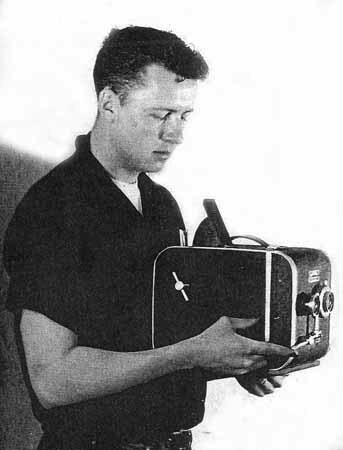 Vincent's grandson, Leo Pruneau Jr., is shown holding a metal prototype of an advanced 35 mm school camera. This camera had less paralax than previous models, a more convienent viewfinder, and a more modern appearance. Vincent decided not to produce the camera, apparently because he felt he was not able to compete with the large manufacturers who were now entering the field of school photography. 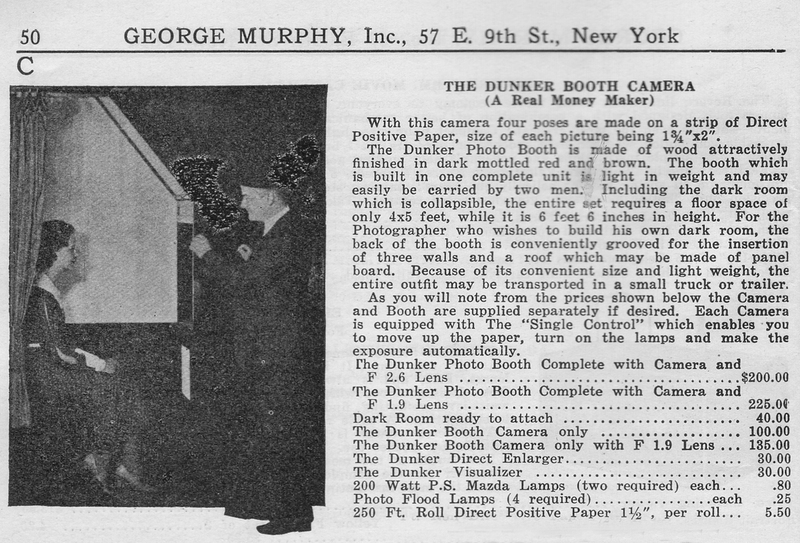 Ad for Dunker photo booth, No. 400 Catalogue (1940) of Photographic Materials, page 50, George Murphy, Inc., 57 East 9th Street, New York, New York. 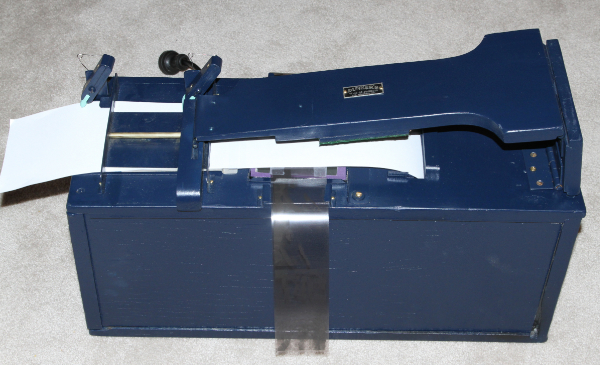 Dunker contact printer and a roll film camera with plunger similar to the one described in the instructions above. 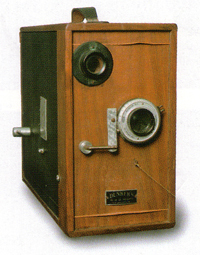 One of Dunker's cameras is in the George Eastman House (Kodak) Museum in Rochester, New York. A second camera is in the Vaughan-Applegate Collection with the Shiloh Museum of Ozark History in Springdale, Arkansas, which kindly supplied the photographs above. The photo on the left is a top view showing the viewfinder port toward the rear. A mirror would be inside at a 45-degree angle so that a ground glass with image near the front of the camera could be seen by the photographer. The photo in the center shows a Seneca lens which is different than that those seen on many other Dunker cameras. The right photo shows a housing between the lens and the film that is not present on some Dunker cameras. 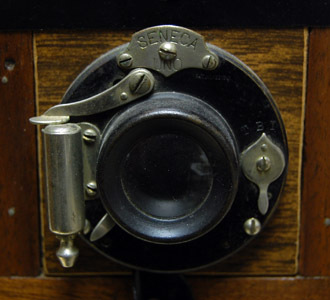 The Seneca lens and the housing between the lens and film may be alterations made by the camera owner. A third type of Dunker enlarger. This particular enlarger was used for many years by Dunker's niece Velda in her darkroom. 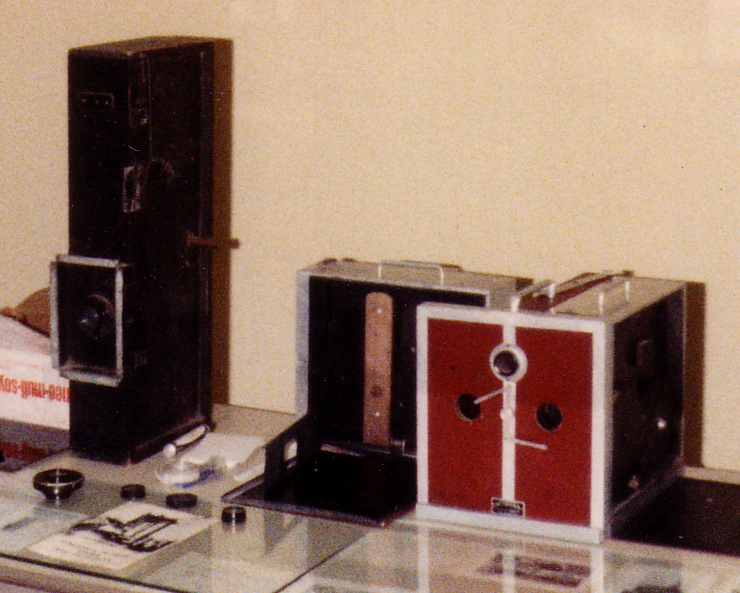 The three cameras shown above are from a May 1983 exhibition of Dunker cameras and photographs by the Missouri Hertiage Cultural Center. The camera on the left is very similar to the direct paper camera shown in the flyer above. The center camera appears to be a 35 mm camera with the film side opened. 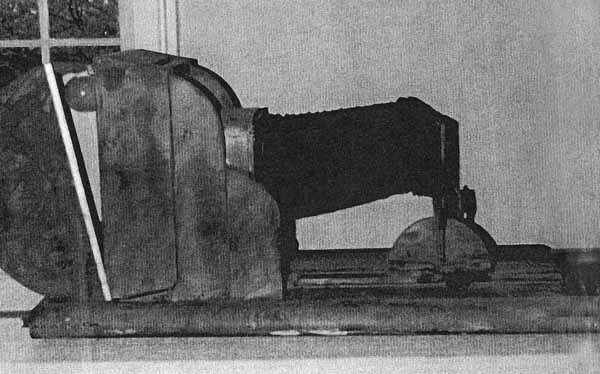 The camera on the right is of very unusual design and according to Vincent's grandson, Leo Pruneau, was one of a kind. It was constructed with two 35 mm cameras side by side such that two identical photos could be taken at the same time. 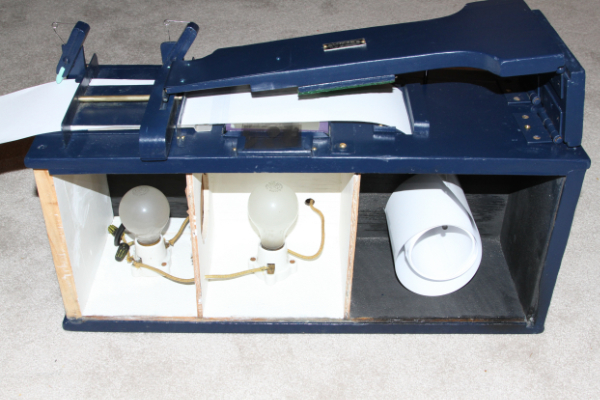 The first photo shows the mechanism for operating both shutters simultaneously. The second photo shows the two cameras separate from the carry case. Each camera was a twin of the other except that mechanisms were reversed so that external controls were on opposite sides. The camera on the left fitted into the near side of the carry case in the above photo. 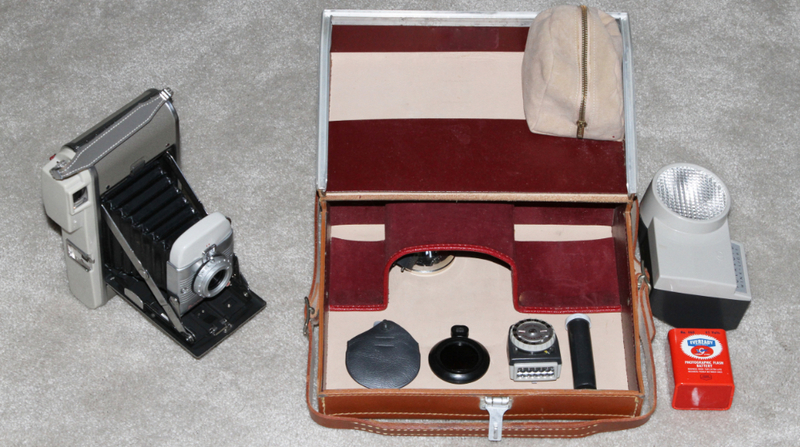 The camera on the right would fit into the unseen side of the carry case once the lens portion was turned to the front. 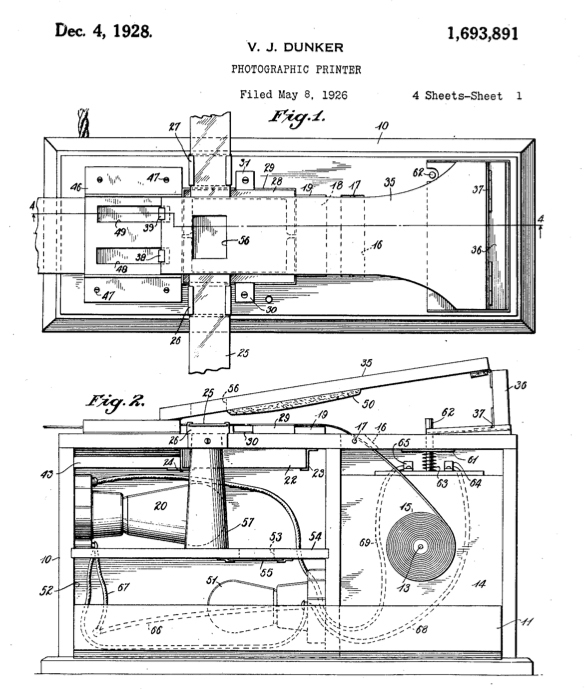 In 1926 Dunker filed for a patent on a contact printer that is somewhat similar in design to the many contact printers sold by Kodak in the 30s and 40s, but rather than making one contact print at a time, the Dunker printer was designed to use a roll of contact paper along with strips of film to produce prints in a more rapid manner. 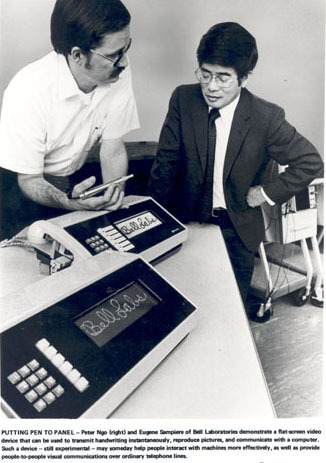 The contact printer was sold throughout the United States as well as overseas. 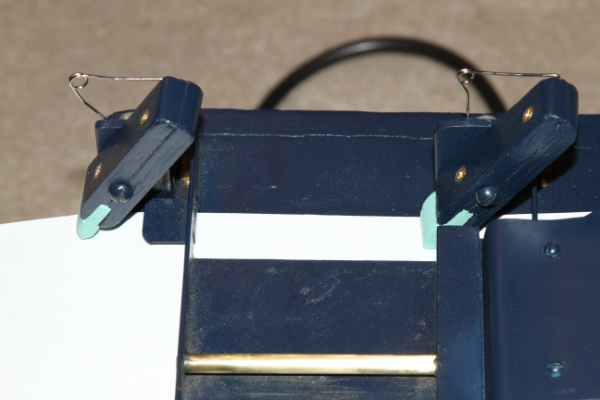 The drawing below shows a roll of printer paper inside the printer and a holder for strips of negatives on top of the printer. Photo on the right is from a 1939 advertisement. The center photo is of a Dunker advertisement for his contact printer. The photo on the right is a Dunker 35mm contact printer owned by his grandson, Bill Pruneau. This contact printer and the70mm contact printer are the only two Dunker contact printers still in existence as far as we have been able to determine. As with other Dunker products, they have inovative features not available on other contact printers of the time. Both the 35mm printer and the 70mm printer had a semi-automatic paper advance mechanism that allowed the operator to make a dozen or more prints a minute versus the one print at a time capacity of the Kodak Amateur Printer and others. 1. 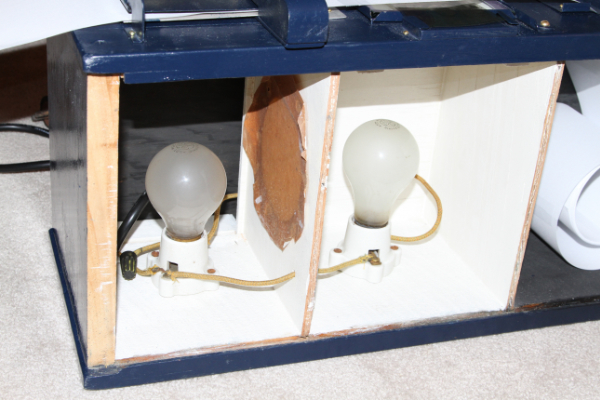 25 watt bulb with brown paper safelight allows the operator to see negative image 2. Exposure is activated when arm purshes button on top upper left of printer. Dunker 70 mm camera as shown in Bill Naeger's book on the right. DUNKER - BREMSON - The Bremson school camera below is a re-badged Dunker school camera and seems to be a duplicate of the Dunker camera in the photo above which is shown in a Ste. Genevieve historical book written by Bill Naeger, Ste. 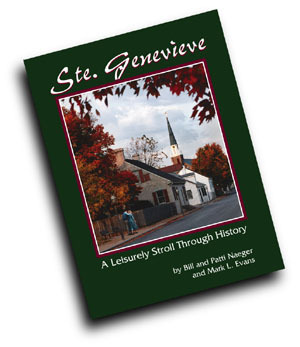 Genevieve-A Leisurly Stroll through History (available on Amazon.com or directly from Mr. Naeger). 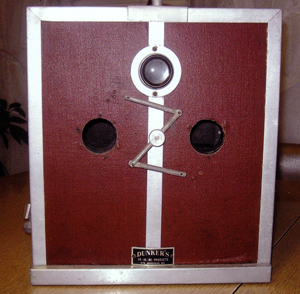 Bremson purchased a number of Dunker cameras for use in school photography and some are found on eBay from time to time with the Bremson name rather than Dunker, but it's not clear whether or not this re-badging was done with the approval of Mr. Dunker. 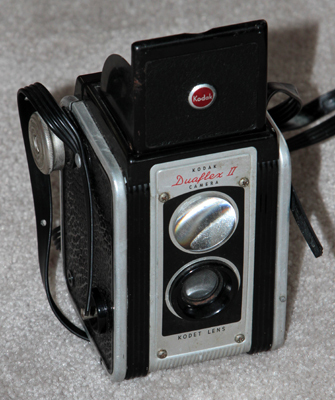 Lustre-Pak was the name used by Bremson Photo Industries, Kansas City, Missouri, when they re-badged the Dunker camera and sold or rented it under their own name. If you have a few gray hairs on your head you may have had your photo taken with a Lustre-Pak, although you might not remember the experience. The Lustre-Pak line of cameras was sold or rented for one purpose only - taking photos for high school yearbooks and selling packs of prints to kids and parents. Kevin Whelan and his father were employees of Bremson Photo Industries during the 60's and 70's and Kevin has supplied much of the information you see here. Kevin says all the cameras he helped manufacture for Bremson were of metal, but that he did repair and reload wooden models also. The cameras used large rolls of 35mm film and the photographers sent the film back to Bremson for developing and printing. A portion of the original Bremson organization split off and eventually became a subsidiary of Kodak. The photography portion is apparently no longer in existence as an Internet search finds nothing of recent origin. In fact, there are only one or two places where Bremson Photo Industries is mentioned at all. Robert S. Bremson Jr., founder and former chairman of Bremson Photo Industries, was also an executive producer for fifteen major motion pictures including "Obsession" in 1976 and was past president of the Bob hope Classic. 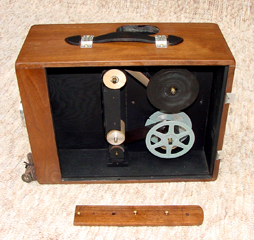 The photos shown below explain how the various features of the Dunker/Bremson camera operate. 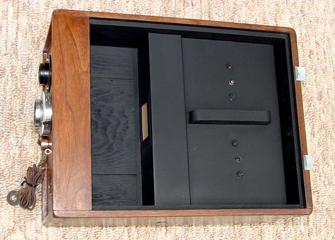 What at first seems to be a simple wooden box camera is actually quite complex in operation. The camera is fixed-focus and entirely manual. 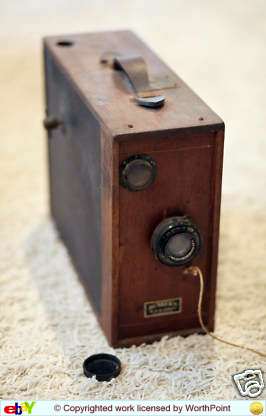 The cord attached to the front of the camera was used to determine the correct distance for the subject being photographed. The mechanism attached to the lens allows the shutter to be snapped using a lever at the rear of the camera. The lens on the upper left front of the camera is for the viewfinder, the hole in the top of the camera. The first photo above shows the left outer cover removed. Directly inside is a sheet metal cover for the rolls of film. The second photo shows the sheet metal cover removed. The third photo shows the wooden retainer bar removed. Film was fed from the upper spool to the lower. The top roller turns freely and acts as a film guide. The middle roller has a rough surface and is turned by the film as it advances. Its shaft extends through the right side of the camera and operates the photo-counter mechanism. The bottom roller is on a movable metal frame which is pushed upward against the middle roller by two springs. The first photo shows a close-up of the right outer cover. In the upper right is the image counter (counter reads 20,778). Just below the counter is the end of the shaft which operates the counter. It can also be manually turned with the camera cover in place. The large knob toward the rear of the camera is for advancing the film. 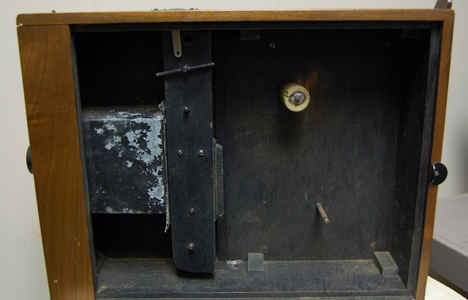 The shaft below that (with the latch holding it in the rear position) is used to lock or unlock the film advancing and photo-counter mechanisms. The viewfinder mirror is at the top center of the second photo. Directly ahead of the mirror is the ground glass imaging plate. The bar going across the middle of the camera allows the shutter to be operated from the rear of the camera. 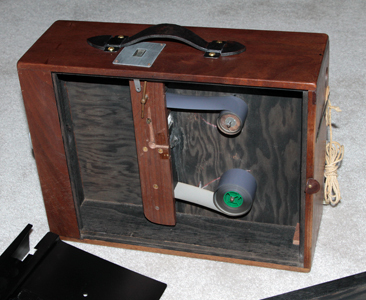 The silver wheel with the attached bar operates the photo-counting device (attached to the outer cover - see left photo). Its shaft extends through to the left side of the camera for the middle roller. As the film advances it turns the middle roller which in turn operates the photo counter. 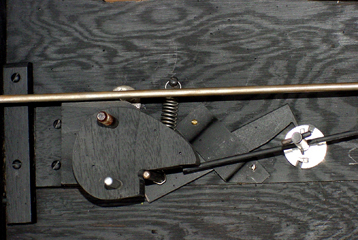 The first photo shows the cog-shaped piece of wood (just left of center) and the shaft (on lower part of cog) which can manually unlock the film advance mechanism and the photo-counter mechanism. It extends through the right camera cover and allows the film advance lock and photo counter lock to be released with the outer cover of the camera still in place (the shaft being held by the latch in the previous photos). 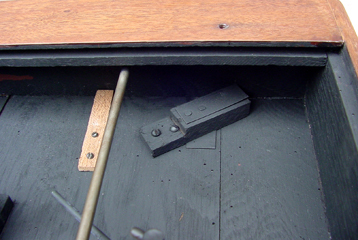 The shaft above that operates the film advance mechanism and has a knob attached when the outer cover is in place (see previous photos). 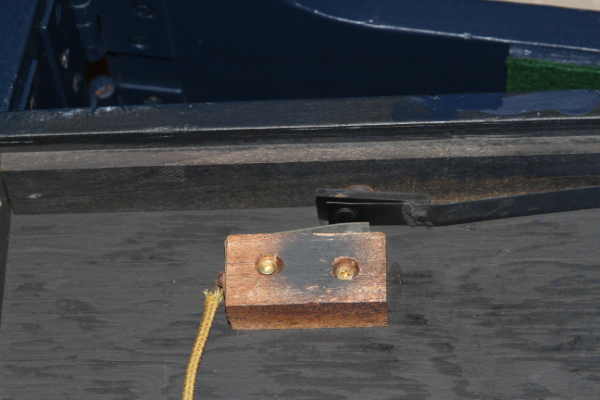 The second photo shows a close-up of the locking bar. One end of the locking bar has a tip which fits into the notches on the silver photo-counter wheel. 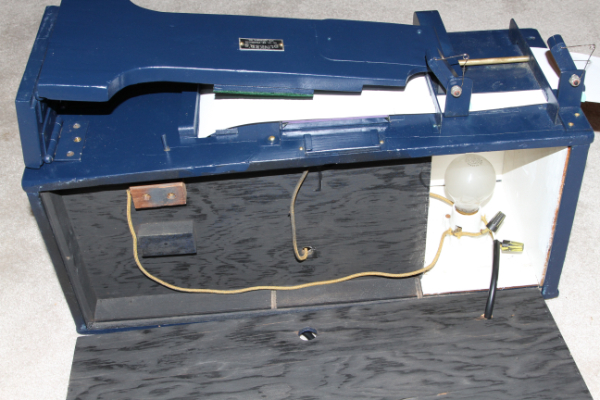 The other end of the bar has a similar tip which locks the film advance gear mechanism. 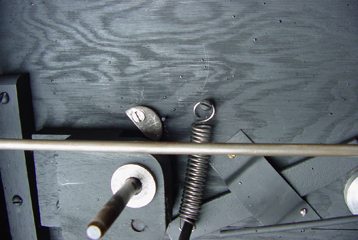 The bar is spring-loaded to the closed position. 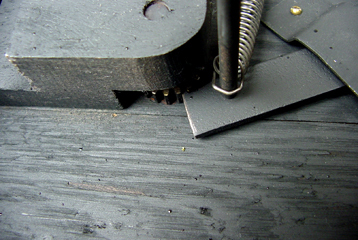 After a photo is taken the lower shaft on the wooden cog is depressed momentarily by the operator as the film is advanced. The cross bar attached to the silver photo-counter wheel turns and trips the photo counter (attached to the camera's right cover - see previous photos). 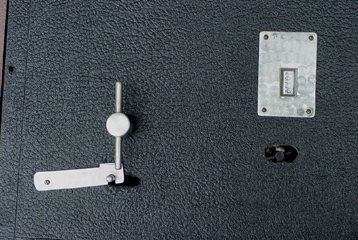 When the film advances the proper distance, the right tip of the lock bar enters the next slot on the silver photo-counter wheel and the left tip of the bar locks the film advance gears. The first photo shows the left tip of the lock bar inserted into the film advance gear mechanism. 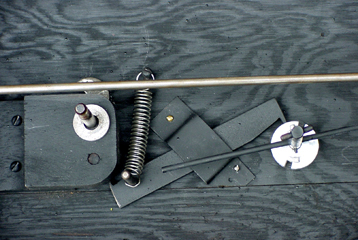 The second photo (wooden cog is removed for better viewing) shows a manual gear lock just to the left of the upper end of the spring andjust above the horizontal rod. 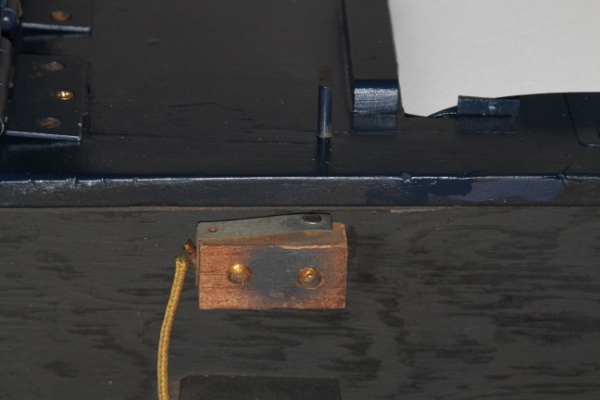 The tip of this gear lock is similar in shape to the tips on the ends of the lock bar and was apparently intended to manually lock the gear mechanism for extended periods of time such as when the camera was being transported. 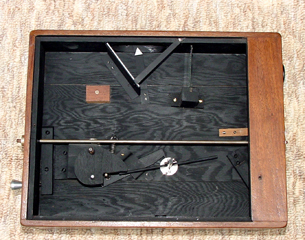 The first photo shows a portion of the mechanism which allows the wooden plate with the photo-counter shaft, film advance gears, mirror and ground glass, all to be moved a slight distance forward or rearward by a shaft extending through the back of the camera (What appears to be joints in the wood are actually separations between the movable center section and the upper and lower fixed sections). This was apparently intended for small adjustments to the focus of this otherwise fixed-focus camera. 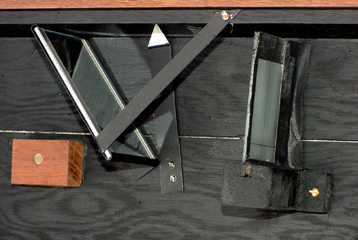 The second photo is a close-up of the viewfinder mirror and ground glass. 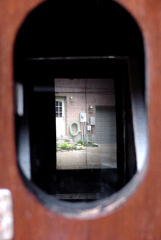 The third photo shows an image as seen through the viewfinder porthole in the top of the camera. 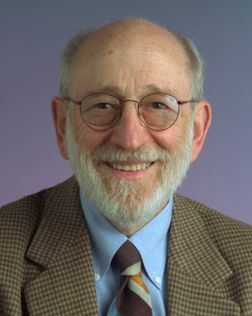 Vincent J. Dunker is an important individual in the history of American photography and deserves to be recognized for his many significant contributions. He was recognized in the Missouri area as being an outstanding photographer of note, but his achievements went far beyond that. He was a master woodworker and had a genius for designing and hand-building cameras, enlargers, photos booths and related items that demonstrated American ingenuity at its best. We have made this article long and detailed because ours is the only publication as of yet that tells the Vincent J. Dunker story. 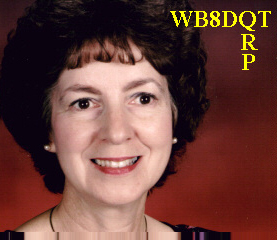 Our sincere thanks and apppreciation to Vincent Dunker's family and friends listed below who were so helpful in obtaining the information provided in the article above. SILICON - 1956. 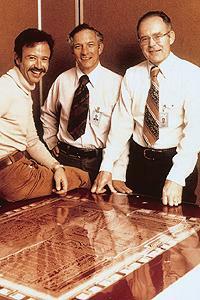 Possibly the first silicon crystal grown in Silicon Valley is shown on the left. Using a new technique invented by William Shockley and Victor Jones, this silicon crystal was grown by Jones around the middle of 1956 at the Shockley Semiconductor Laboratory of Beckman Instruments, Palo Alto, California. The crystal was "pulled" through a surface heater that was used to produce a molten pool of silicon in a solid silicon body held at a temperature just below the silicon melting point. The concept underlying the Shockley-Jones invention was that a silicon crystal would not be contaminated by crucible impurities if the effective "crucible" was formed in zone refined silicon. The shaping was a result of changes (mostly intentional) in the power supplied to the surface heater. 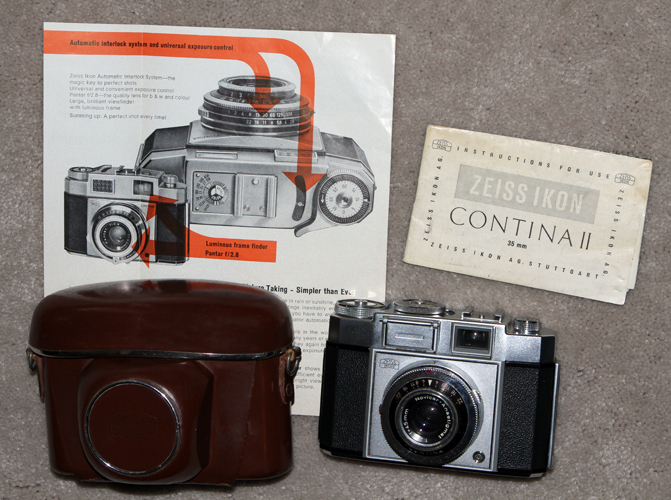 ZEISS IKON CONTINA II - 1956-58. The II was an improved model of the IIa of 1954-56. lens f/2.8, 45 mm. Shutter to 1/300 sec. The above camera in excellent condition was purchased for only $20, however, the manual and advertisement cost an additional $40! There appears to be some skullduggery going on in the used camera market. Many cameras are sold without the original manual that somehow didn't accompany the camera when sold, but often appear on eBay for asking prices of $15-25. Since collectors quite naturally like to have the case and manual that originally came with the camera, they are at the mercy of those who like to play this little game of selling the two separately. The sellers know that they will recieve little or no more in bids for a camera that is offered with its manual than for one that is offered without, so those with a little larceny in their hearts find the opportunity to take advantge of their customers something they find hard to resist. 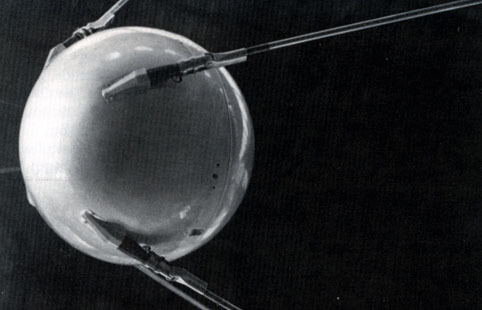 SPUTNIK RECORD - 1957. 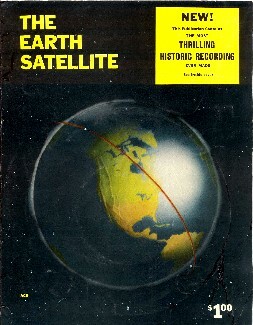 "The Earth Satellite" is a booklet and record commemorating the first earth satellite. 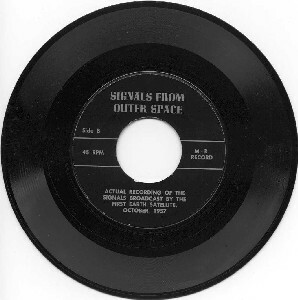 One side of the record has a dramatization of the Sputnik launch; the other has actual signals broadcast by Sputnik from space. The booklet containing the 45 rpm record was distributed by Mooney-Rowan Publications. 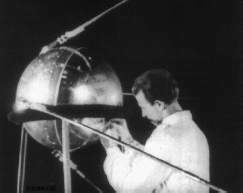 The booklet provided information concerning the launch of Sputnik as well as the U.S. Project Vanguard program which was underway at that time. POLAROID MODEL 80, 80A & 80B HIGHLANDER - 1954-61. Lens f/8.8 100 mm. Shutter B, 1/100 and 1/25. The cost of the camera alone (80A, top ) was $72.50 ( about $562 in 2010 dollars). The entire kit above in excellent condition was purchased on eBay for $9.99. Polaroid Model 80B (Highlander): Made 1959-61 and is the third and final version in the Model 80 series of cameras (bottom photo). Retains all the other advancements and changes of the first two models except it has a different cutter bar and film release switch. 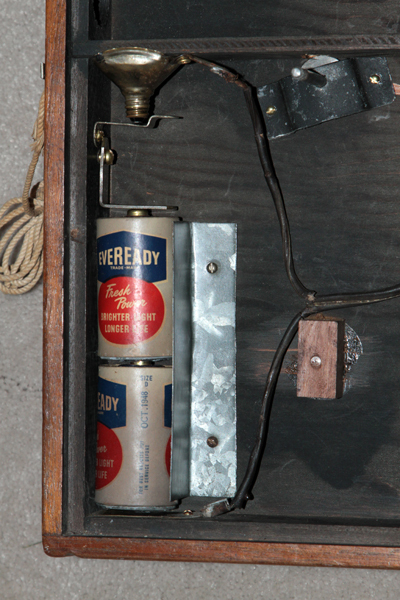 Note the 45 volt Eveready battery. MSRP $72.75. Camera and kit in excellent condition donated by our good friend, Joan Klonowski of Grants New Mexico. FIRST SCANNED PHOTO - 1957. 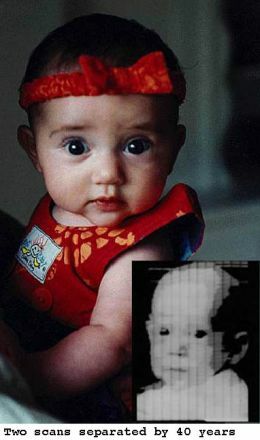 Russell A. Kirsch of the National Bureau of Standards scanned the first photograph into a computer, an image of his baby son. 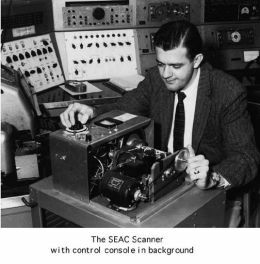 Scientist Russell A. Kirsch and his colleagues, working at the National Bureau of Standards in the mid-1950's, constructed a simple mechanical drum scanner and used it to trace variations of intensity over the surfaces of photographs. They converted the resulting photomultiplier signals into arrays of 176 by 176 binary digits, fed them to a SEAC (Standards Electronic Automatic Computer ) 1500 word binary computer, and programed that computer to extract line drawings, count objects, recognize characters of type, and produce oscilloscope displays. 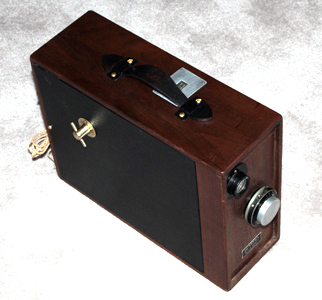 As with the Bartlane transmission system of the 1920s, a photo was digitized by the scanner. It was not called digital photography, but if an object other than photograph were to be scanned and thus creating a digital photo, that could rightly be called a form of digital photography. In 1961, Eugene F. Lally, a JPL engineer, took the digitization concept to its next logical step with his mosaic guidance proposal whereby arrays of detectors in a camera would detect the position of objects in space for the purpose of guidance and navigation. Digital Photography, Mikkel Aaland, 1992, p9. Flash: M-sync via Polaroid "hot shoe," X-sync via a special bi-pin connector. Double-window viewfinder/rangefinder on top of camera, with automatic parallax compensation. Early production models have a plain cutter bar. Later examples have extra light seals, and slightly later ones yet also have a locking cutter bar. The presense of the extra light seals can be determined by looking for the letter 'L' in front of the serial number. SSTV - SLOW SCAN TV - 1957. 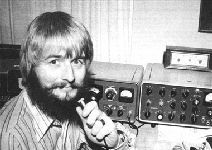 Copthorne McDonald (last photo) formatted the concept of SSTV - a means of transmitting still televison images over an audio channel such as by HAM radio similar to the way still images are transmitted via video telephones (see 1985). Originally, the SSTV monitor used a P7 phosphur surplus RADAR picture tube which could hold an image about 8 seconds before it completely decayed (1958 McDonald SSTV monitor shown on upper left, camera on upper right). 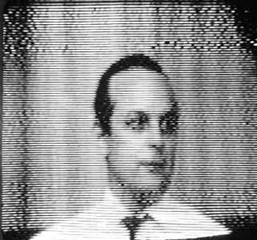 Early SSTV images were of poor quality and in black and white, but later SSTV improved greatly in quality as well as adding color. 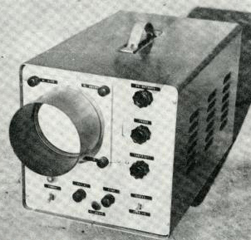 Although such equipment was eventually made available comercially, early pioneers of SSTV had to build their own and as late as 1969 there were fewer than two dozen slow-scanners in the world. For additional information concerning the development of SSTV refer to the below sources. POLAROID PRINTER COPIERS - 1958. The Polaroid printer copiers were designed for use with various Polaroid cameras (Model 240, shown above, was for use with camera Models 95, 95A, 95B, 100, 150, 160, 700, 800, 850 and 900). 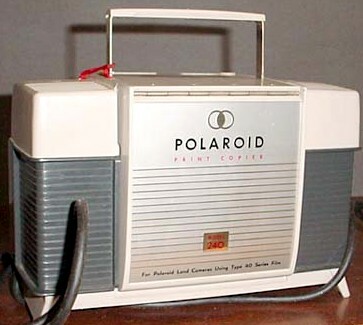 The printer copiers were accessories for making copies of Polaroid prints. When unfolded, they somewhat resembled a slide projector. Prints were loaded into a holder in the back of the device. The camera was positioned on a rail at the front of the Copier-- the lens of the camera mated with a close-up lens built into the Copier. Two small 120-volt bayonet-base light bulbs in the Copier served as a fixed source of illumination for the print to be copied. The camera's exposure was set for this constant exposure source (via a chart supplied with the copier), and the picture was taken and developed in the usual way. The Copier was supplied with a cable release (for the camera) and had a built-in electric exposure/development timer (which was powered whenever the light bulbs are switched on), and (starting in 1959) came with a set of neutral-density filters for the light bulbs for use when 3000-speed film was used in the camera. ARGUS V-100 - 1958. The V-100 was considered to be one of the best cameras ever marketed by Argus. Made in Germany, it was a rangefinder camera with built-in meter and a hot shoe. Lens 48mm f2 or 52mm f2.8. Synchro-Compur shutter. ARGUS C3 MATCHMATIC - 1958. 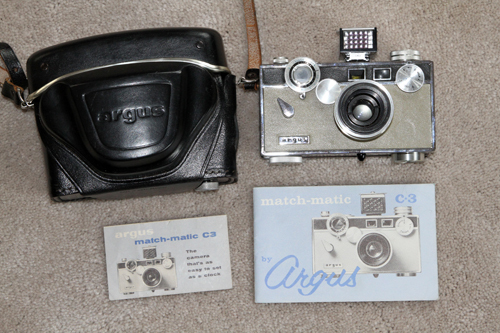 The Matchmatic variation of the Argus C3 was named as such because of the separate light meter placed in the flash shoe which was used to determine the proper aperture for a specific film speed and shutter speed. Note to prospective collectors. It is often necessary to purchase more than one copy of a particular camera in order to obtain a suitable collectible. The above camera, now in near mint condition with case and manual, was the result of three separate purchases. 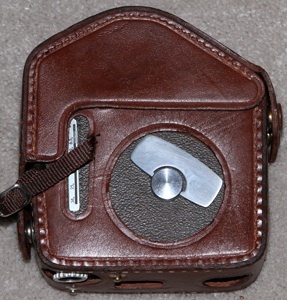 The camera shown had a poor quality case, no light meter, no manual, and the back had a significant depression caused by the rear snap of the case. One of the other cameras came with the very nice case shown above which has an inner liner of cloth that prevented that camera from having a depression in the back. The back on the above camera was replaced with the back that was in perfect condition and cases were exchanged. 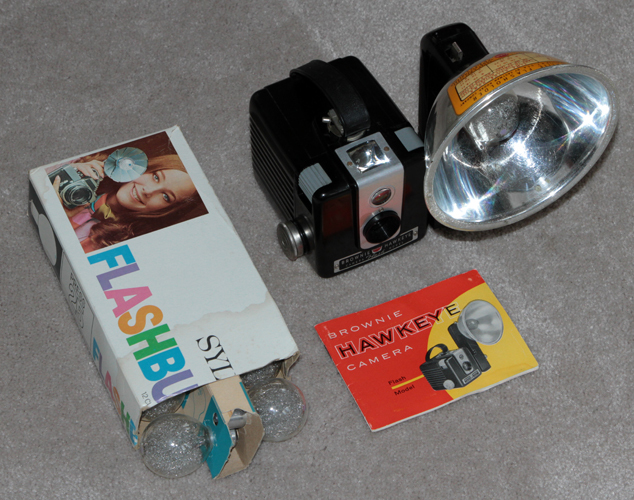 The other two camers came with working light meters and one had the manuals shown above. Those two cameras are now kept for parts if needed. The total cost of the three cameras on Ebay was only $50 and resulted in the very nice collectible set you see above. A two-tone tan and black Matchmatic similar to the one above was used in the film Harry Potter and the Chamber of Secrets. 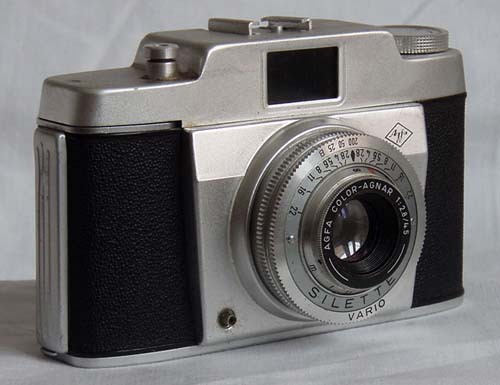 AGFA SILETTE VARIO - 1958. The Vario was a rangefinder camera with Agfa Agnar f/3.5 45 mm lens and shutter up to 1/200 sec. KODAK BROWNIE TURRET F1.9- 1958. STANDARD LENSES: Cine-Kodak Ektanon 9 mm, 13mm 24 mm f/1.9 . SPEED: 16 frames / second. VIEWFINDER:folding Sports Viewfinder. FILM: 8 mm. 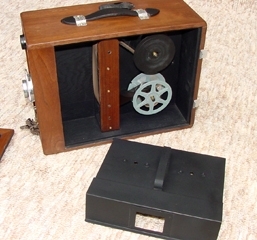 Amateur movie camera for double run 8mm film with 25 feet load. It has three lenses on a rotating turret; a 13mm, a 24mm and a 9mm wide angle lens. Double run 8mm film is run through the camera twice, the first time exposing half of one side of the film, the second time half of the other side. The film is then cut and spliced together to create one length of film of 50 feet. Donated by our good friend Joan Klonowski of New Mexico. 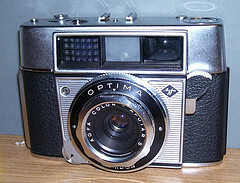 AGFA OPTIMA - 1959. The 1959 Agfa Optima is credited with being the world's first fully automatic 35mm camera. It's most notable exterior feature is the shutter release on the left side of the camera. 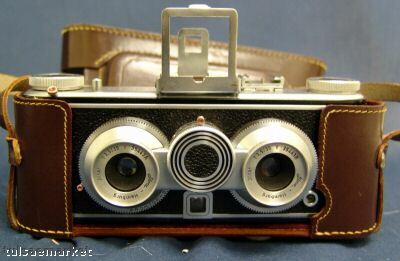 In The following year Agfa released the Optima I with the shutter release on the right as with most cameras. KODAK RETINA REFLEX S - 1959. The Retina Reflex S was built on the Kodak Retina IIIS rangefinder body. It shared the rangefinder's bottom mounted wind lever, Synchro-Compur shutter, count-down frame counter and top-mounted match-needle selenium cell metering. The first Kodak Retina Reflex was marketed in 1958. A year later, the factory in Stuttgart adopted the Deckel bayonet mount for their IIIs rangefinders and Retina Reflex S cameras. This allowed for a broad range of interchangeable lenses. It also improved the optical performance of the camera since each lens focal length could be optimized individually. Deckel, a company based in Germany, is the creator of the Compur shutters and the designer of the bayonet mount for the Retina Reflex, Voigtlander Bessamatic and Ultramatic cameras. MSRP $215 (about $1,750 in 2015 dollars). 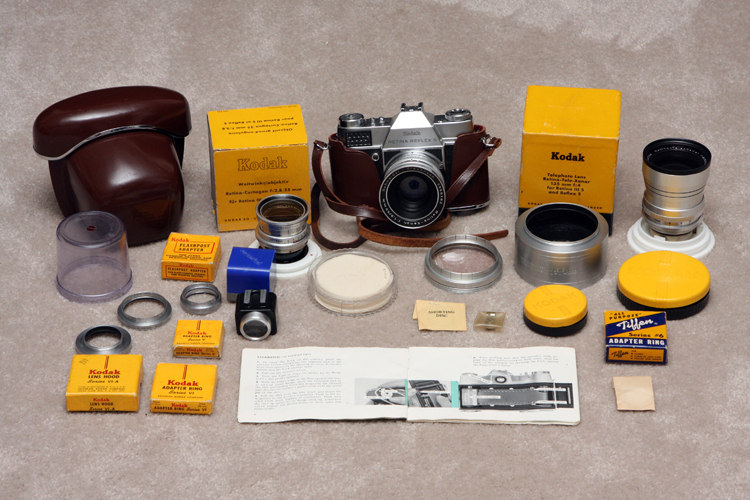 This camera and its many accessories were donated to the museum collection by Joan Klonowski, Grants, New Mexico. BELL & HOWELL ELECTRIC EYE - 1959. One of what seems a countless number of Bell & Howell movie cameras. This camera in near mint condition was obtained at a yard sale by my daughter for $5, however, the original manual cost and additional $16.85 on eBay. The original case will cost even more yet. Moral: beware of daughters bearing gifts! BELL & HOWELL ELECTRIC EYE 390E- 1959. Similar to above, but with film speed adjustment on upper left of camera. Camera and case in excellent condition: $10 on eBay. 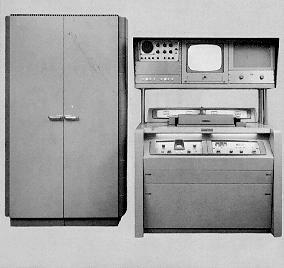 XEROX 914 - 1959. The Xerox 914 was the first automatic office copier to make copies on plain paper. It was introduced by Haloid Xerox. 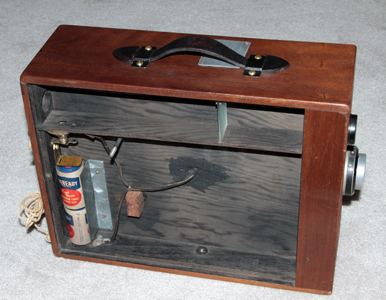 A floor-mounted device, it was designed by James G. Balmer of Armstrong-Balmer & Associates, in collaboration with Don Shepardson, John Rutkus and Hal Bogdenoff of Xerox, who had developed an engineering prototype. 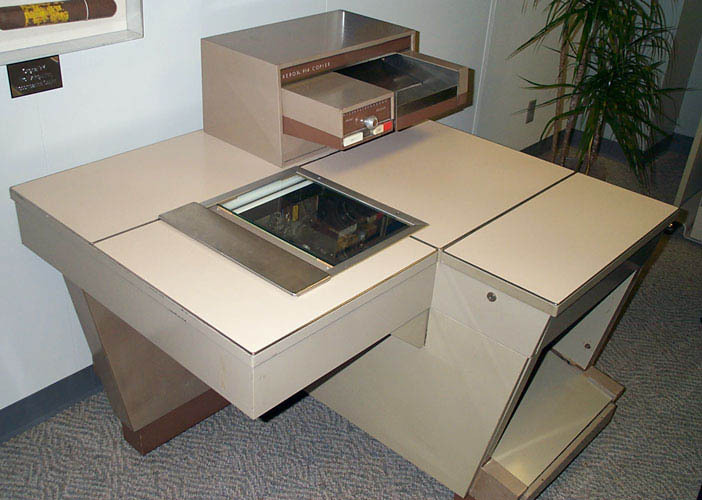 Xerox named their first product the 914 because it could reproduce documents up to 9 inches by 14 inches in size. It took about 15 seconds for the first copy to come out, and 7 seconds for each additional copy. It was 42 in. high, 46 in. long, 45 in. wide and weighed 648 pounds. The advertising campaign consisted on a TV commercial with a little girl making copies for her father who was dressed as a businessman. A single 914 had a price tag of $29.500 while competitors wet copiers were sold for about $400, so Xerox copied IBM's leasing system, whereby a company could lease the copier for $95 per month (2000 copies free) and 5c per extra copy. Xerox made four versions of the machine: 914, 420, 720 and 1000. The only difference being the motor speed. The 914 could make 7 copies a minute while the 1000 could make 17 copies a minute. The Xerox 914 sold as many units in the first 6 months as what had been projected to be the entire lifetime demand for the product - and the number was that low only because they couldn't physically make enough 914's to meet the demand! For a fasinating first-hand story of working with early Xerox copiers click on the link below. FIRST MARKETED VIDEOPHONE - 1959. The first Commercially Marketed Video Phone was the Bell Laboratories PicturePhone of 1959. The Bell version also sent still images. A lot of video telephones included picture printing and saving capability before still video cameras were introduced. They were often used by Doctors to take pictures of patient problems in remote areas and send them over standard telephone lines. Information provided by Mike Mozart of JeepersMedia.